Stirling’s herd of magical reindeer have flown home following the success of the city‘s first Reindeer Trail. 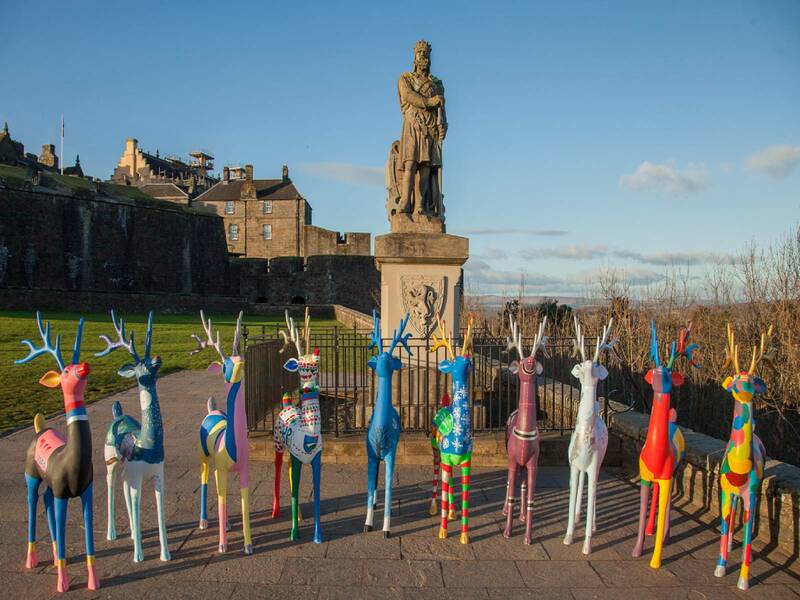 A group of the animals, designed and decorated by local schoolchildren, paid a flying visit to Stirling Castle after leaving the city centre shops and cafes where they were homed during the festive season. They have now returned to their secret location but will be back for the 2019 Stirling Reindeer Trail this winter after the initiative organised by Go Forth Stirling Business Improvement District was hailed a success. “We’re delighted with just how popular the Reindeer Trail proved with local families and the traders who took part. “When you launch a new initiative like this you can never be 100% sure how it will go. “I want to thank all the school pupils and teachers involved for their hard work and imaginative designs as well as the local authority. Schools across Stirling took part in the innovative project which will return later this year with a new theme for the 2019 festive season. “The Reindeer Trail was a fantastic initiative for Stirling’s schools to be involved in and it produced a real excitement among pupils. “The reindeer they created were diverse, individual and imaginative. We set up the opportunity like a real design job, sending the schools a brief and asking the children to create a prototype design. Pupils were invited to come up with individual or group designs for the Reindeer Trail project with more than 160 entries submitted. A total of 20 winners were chosen from 17 schools who were provided with paints to decorate the 1.7m high 3D reindeer. The 20 life-size reindeer were then placed in the diverse range of shops and businesses across the city from Waitrose in the Burghmuir Retail Park all the way up to the Darnley Coffee House near the Castle. Shoppers were encouraged to pick up a map complete with clues and find all the reindeer – naming the school which designed and painted the reindeer when they spotted each one – in a competition which could win them an iPad. The aim was to increase footfall and circulation around Stirling city centre as well as create a fun and festive atmosphere for shoppers in the run up to Christmas. More than 800 competition entries have been received by Go Forth Stirling and are currently being checked over by staff. Over 9,000 entry forms were collected by shoppers and on top of this, many more were downloaded from the Stirling City website. All entrants with the 20 correct answers will be placed into a prize draw and the iPad winner, plus five runners-up, will be announced later this month. Meanwhile, one of the schools involved will win a prize for their design after competition entrants were asked to vote for the Best Reindeer Design. Published by Blackburn Communications on January 14, 2018. As featured in Primary Times, Scottish Field and What’s On Stirling.